After having consolidated its presence in the motoryacht and express cruiser sector, the Cantiere Gianetti boatyard is now set to makes its debut also in the production of maxis with this unprecedented 24-metre. The boat, in fibreglass and the realisation of which is still in progress, will be EC certified as an "A" project category, but her measurements will be calculated to meet the parameters required by RINA Class 100 A1.1. Designed by the yard's technical office, she has a displacing bottom, with stability amplified by the presence of hydraulically powered, fixed stabilising fins, equipped with bow thrusters for manoeuvring and powered by 2,660 HP that, thanks also to a fuel reserve of no less than 20 thousand litres, will be able to provide considerable autonomy in terms of mileage. As far as concerns the interiors, which can however be personalised, the owner's suite is situated amidships, practically under the wheelhouse and guests have cabins both in the bow and astern. There is a special crew area in the bow next to the galley. The latter is on the main deck, along with the dining area and a large saloon. 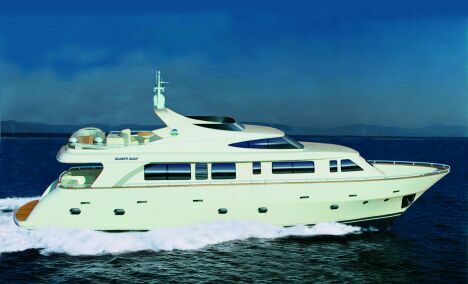 For information: Gianetti Yacht via Fosso Guidario 55049 Viareggio (LU) tel 0584 384655 - Fax 0584 392335 - web: www.gianettiyacht.com.